Our client centric approaches have enabled us to manufacture, supply and export a genuine range of Anti Vibration Cork Pads that is available at the market leading prices. 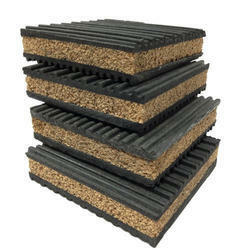 These offered pads also include under its range, Vibration Pads and Anti Vibration Sandwich Type Cork. Before dispatching our products to the clients' end, our team of quality controllers inspect our manufactured pads following organizational guidelines. Followed by this, we have been able to win confidence of our large number of clients across the country. Symbolic to all the achievements that we have attained in this realm, maintain our position as an eminent provider of a precision-engineered range of Cork Anti Vibration Pads to our patrons. Our offered product is manufactured under the vigilance of deft professionals by applying the latest production methods. These pads are used in Refrigeration plants, Conveyors, Diesel generators, Fans motors, Compressors and Air conditioning air plants. 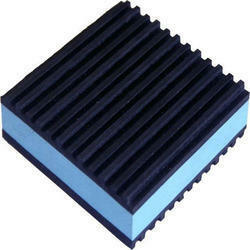 We hold expertise in offering a high-quality array of Rubber Cork Anti-Vibration Pad for our clients. These products are precisely designed for vibration isolation solution. To eliminate any possible flaw, quality controllers examined these products on well-defined quality parameters. Further, we are offering these products to our precious clients at market leading price range. Loading should not exceed 3.5 kg/cm2 (50 psi) Allow at least 12 mm (1/2") overlap all around. Looking for Anti Vibration Cork Pads ?